You will find that wool area rugs differ greatly in terms of their quality and price. This is due to a number of variable factors, but primarily it is simply down to the many different varieties of sheep’s wool that can be used in the production of these rugs. Not only can the wool vary depending on its breed and country of origin, but its age and general health will also help to determine how good the wool is, and ultimately, how much it will cost to buy. Even the manner in which the sheep is sheared can greatly affect the quality of the area rug and how the finished article actually looks. Whilst the rug itself is made up of natural sheep’s wool, many so-called wool area rugs will have been made using a synthetic backing to hold the whole thing together. Although this does not pose a problem in terms of the quality of the rug, if you are looking for a very natural and environmentally sound product you should be seeking out specialist rug manufacturers who deal specifically with natural fibers like jute and cotton. It is now even possible to purchase natural rubber adhesives and pads, giving you a completely natural and biodegradable accessory that will not release any harmful gasses into the environment or your home. If your wool area rug is going to be used in a busy area, such as a hallway or living room, take care to choose one that is going to be able to withstand the test of time. 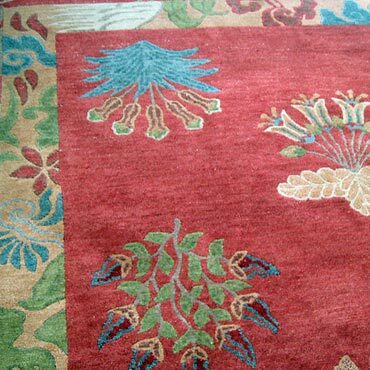 Although wool is known for its toughness, some applications, particularly those used to manufacture oriental rugs, use very long fibers which are not always practical for area rugs that have to withstand a large amount of human traffic. For nearly 75 years, Couristan Inc. has been a powerful name in the area rug and broadloom industry. Acquisition builds on Stanton’s market position as a leader in the premium carpet .